<section begin=fatext1 />SAN FRANCISCO, California -- Since the dawn of war soldiers have always been taught to react to hostile fire by ducking under cover. But a new weapon designed by Apple for the U.S. Army makes that tactic obsolete. 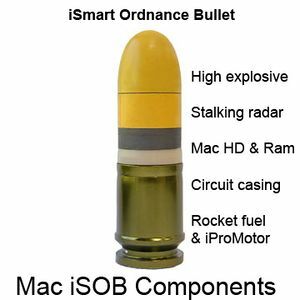 The enemy can run but he can't hide when stalked by the iSmart Ordnance Bullet (iSOB). 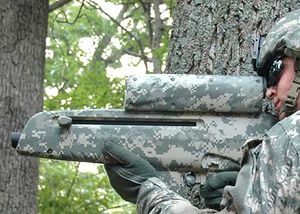 After years of development at testing sites such as Vietnam, Cambodia, Laos, Korea, Iraq, Somalia, Panama, and Libya, etc., the U.S. Army is finally set to unleash the new ultra-smart technology into the heat of battle. The ion-battery-powered iStalk Target System (iSTS), is essentially a high-tech thingamajig that can be programmed so the special 25-mm explosive round, the iSOB, actually stalks and follows the target, and when the bullet is close to the enemy it explodes with the force of an M67 grenade. “With this weapon system we stalk [enemy targets] forever,” Lehner told Fox News on Wednesday. “Tactics are going to have to be rewritten. The only thing we can see [enemies] being able to do is shoot themselves first. Lehner said the first iWeapons were distributed to combat units in Afghanistan this week. The 12-pound, 29-inch system, was designed after 9/11 by Steve Jobs of Apple Computers and it will cost the military $3.50 per unit, with an additional $900 per iSOB bullet. While highly sophisticated the iWeapon is so easy to use that even senior-officers can become proficient within several firefights after memorizing the 1,200-page user manual. Once the trigger is pulled and the round leaves the barrel, a computer inside the projectile communicates exactly where the target is and how far the bullet has traveled, allowing for precise detonation behind or ahead of any target. There is also a special App on iTunes for the weapon called, “Stalk-n-destroy” which allows the smart round to follow the target up or down stairs and into tunnels. With this extra App the bullet can also peek behind doors and defuse booby traps. A General is passing urine when his/her patrol encounters an enemy combatant in a walled Afghan village who fires an AK-47 intermittently from behind cover, exposing himself only for a few seconds (flashing), and again to fire. The patrol's leader calls for the General that was passing urine who zips up, and then uses the weapon's laser range finder to help compute the distance to the target with a pocket calculator. He then uses an incremental button located near the trigger to add moxie plus 1 meter to the round's distance, since the enemy is hiding behind a wall. The round is fired, it flies past the enemy, makes a screeching u-turn, flies back, and upon nearing the target it explodes with a blast comparable to a hand grenade. This blows the enemy into many pieces which are nearly impossible to reassemble. “This is revolutionary for other reasons than just being an Apple product,” Lehner said, citing increased efficiency, safety and lethality. “This is the first time we're putting Apple computer technology into individual exploding bullets for our generals. Each bullet contains a one gigabyte hard drive along with propellant and high explosive. We feel it's very important to field this because it makes us much more trendy and keeps us ahead of our probable enemies. It also gets our generals off their lazy asses and into harm’s way. But we have a feeling other people will try to copy us – because like all Apple products these smart bullets are produced in China.